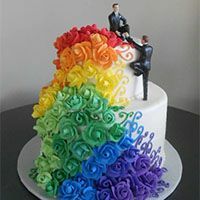 The issue addressed by the meme is a case before the Supreme Court: Jack Phillips, a Colorado baker and owner of Masterpiece Cakes, refused to bake a custom wedding cake for two men on the grounds that he was religiously opposed to gay marriage. Colorado has a non-discrimination law that applies to businesses, and the couple complained to the state's Civil Rights Division, which found Phillips to be in violation of the statute. Phillips has now appealed that decision to the highest level, and sometime in the next year, we will learn whether public businesses can discriminate against protected minorities by appealing to the First Amendment. The case is complicated by many factors, including the conflict it presents between the freedoms of expression and religion, and the right of state governments to offer a higher standard of protection to historically victimized minorities than that provided under federal statute. Acknowledging I am, at best, an amateur when it comes to legal analysis, I'm not going to attempt to parse the case itself. I am, however, a degreed theologian and Biblical scholar, so I feel very comfortable critiquing the religious argument being presented by Mr. Phillips. Quite simply, he hasn't got a pot to piss in. At least, that's my sermon sentence, the conclusion I'm going to build up to in the course of this essay. Now you know where I'm headed, I'll go at it systematically, as any serious preacher would do. First, consider Jack Phillips's sectarian persuasion: as an evangelical, Phillips professes a faith that is Bible-based. I've long wrestled with the evangelical embrace of scripture, especially with those who claim (as a former parishioner of mine once did) that the Bible "says what it means and means what it says." In fact, depending on the presuppositions of translators and interpreters, any given passage of the Bible can be interpreted to mean many different things, especially when its taken in the light of its historic and literary contexts. Add to that the incredible diversity of the Bible--its writers span a thousand years of ancient history, and their ideas run the gamut of the Hebrew, Israelite, Palestinian, and Gentile cultures that gave birth to them. Simply put, then, an appeal to the literal meaning of any Biblical text demonstrates a profound ignorance of the nature of that text. All that aside, there is simply no text in the Bible that tells business owners to turn away clients based on their perceived morality, or any animus they may feel toward them. Quite the contrary: the Torah contains many directives to include foreigners in festivals and Sabbath observances, making it clear that they are to be treated as fairly as fellow Jews. (e.g., Exodus 12:49, "there shall be one law for the native and for the alien who resides among you.") If anything, Old Testament law specifies that those who are part of the covenant shall make no distinction when it comes to strangers, treating all with dignity and respect. Jesus heals a woman whose chronic hemorrhages have rendered her ritually unclean. (Mark 5, Matthew 9, Luke 8). Jesus heals a Samaritan leper (Luke 17). Jesus chides the Pharisees for being less righteous than tax collectors and prostitutes (Mark 21). Jesus turns away men who would stone a woman caught in adultery (John 7). These are just a few of many stories in which Jesus scandalizes the business and religious leaders of his time by socializing, ministering to, and accepting hospitality from people who, for one reason or another, were deemed unworthy of participation in polite Judean circles. Again and again, Jesus makes it clear by his actions that, like his divine father, he makes no distinctions. There is equal protection under the Gospel. Contrast Jesus' hospitality and generosity toward those he was culturally conditioned to fear and avoid with the "right to refuse service" being claimed by Christian merchants like Jack Phillips, and it's impossible to avoid the conclusion that rather than being guided by the faith of Christ, they are hiding behind the banner of Christianity to justify actions Christ would find abhorrent. That's why, in previous Supreme Court decisions expanding the protections of the Constitution to include gays and lesbians, Justice Kennedy has been particularly critical of the animus aired by conservatives like Phillips. The only religion being espoused by Phillips and his evangelical ilk is bigotry, elevated to the status of dogma. And yet, before we simply dismiss the rightness of Phillips sheltering his odious business practices beneath the shield of religion, we have to acknowledge something huge: he's far from alone. In fact, there are millions of Americans who, believing their bigotry to be a Biblical doctrine, are fully on board with what he's doing, and consider him a martyr to the cause of religious liberty. Typically at this point in a piece like this, I find myself launching a screed about all that is wrong with Christianity, and not just the modern variety. I've written in the past about the integral link between the anti-Judaism of Martin Luther and the Holocaust; the persecution of Jews, Muslims, and pagans by both Roman Catholicism and Protestant churches; and the ways in which Catholics and Protestants have taken turns persecuting each other. Bigotry is hard-wired into Christianity, just as it is, in one way or another, into every world religion. Pakistan and Bangladesh exist because Gandhi couldn't convince Indian Muslims and Hindus they could live together in peace. The Baltic wars were, to a large extent, religious conflicts. As atheist comic and commentator Bill Maher is fond of pointing out, the one thing almost all conflicts and mass persecutions have in common is religion. But that's not where I want to go here. In fact, as I hope the passages referenced above indicate, today I'm feeling much more sanguine about the roots of the faith I was raised in. As one of my seminary professors liked to say when systematically vivisecting a fellow student's naive beliefs, "Give me that old time religion, the religion of Jesus and Paul, before the church got hold of it and turned it into this nonsense." For all the problematic passages in the ancient scriptures, they are still primarily a history of the evolution of loving, ethical living, of a community whose God was big enough and inclusive enough to embrace every human being, no matter how screwy their own beliefs might be. These are not just airy-fairy, pie-in-the-sky Hallmark sentiments, either: every major religion at its best promotes generosity and compassion toward strangers. That's what empowers me to say that honoring diversity and welcoming sojourners are not just an extreme, radical concept that liberals are forcing on conservatives. As I wrote just yesterday, the arc of the moral universe is bending this way. Deep down, we know that the grace we extend to people who are just like us is far cheaper than that we are called to extend to those who are different from us. It's not just that we're called by scripture and tradition to offer hospitality to strangers, making no distinction about their class, creed, ethnicity, or orientation. The practice of hospitality is profoundly reciprocal. I have found myself welcomed and ministered to by people of other faiths, gay men and lesbians, Jews and Gentiles, churches composed almost entirely of African-Americans or Hispanics, Ghanaian animists, British Thatcherites, and on and on. Experiencing hospitality, I find myself prompted to practice it. The Bible references this reciprocity as far back as the book of Exodus, which reminds the Israelites that they, too, were once strangers in a strange land, having to rely on the hospitality of strange people who had strange beliefs but were, nonetheless, good generous people. So I don't just think I'm right: I know this is the future toward which the arc of the moral universe is bending. Which is precisely why Pat Robertson, Franklin Graham, and the evangelical community are poured their prayers and gifts into pushing Jack Phillips's case all the way to the Supreme Court, and are so delighted that the Republicans succeeded in keeping a moderate like Merrick Garland off the court. They are afraid of a future in which the fig leaf of religion can no longer hide the ugliness of bigotry, a future in which they must learn to live with people who don't believe in their small-minded God, preferring to worship a God who's much bigger and more inclusive--or no God at all. They are conservative in the worst sense of the word, clinging to the old chauvinist, hateful ways because it's just more comfortable to be around people who are just like them, rather than waking up to the diversity of the world we really live in. The power of this frame of reference is crumbling. Gay and lesbian people are getting married, and increasingly, America as a whole is fine with it. Women have been getting legal abortions since 1972, and America, again, is largely just fine with it. In fact, in case after case, the majority of Americans are significantly to the left of the evangelicals and Republicans who claim to represent true America, and who are scrabbling to hang onto its hateful traditions. Out of desperation, evangelicals have been embracing politicians who are ethically and morally bankrupt. For all his insistence that he bases his actions on scripture, Roy Moore is as anti-Christian a politician as has ever occupied a space on an American ballot--as is his sponsor and chief campaigner, President Donald J. Trump. Evangelical leaders turn blind eyes to the daily misbehavior of their corrupt champions, ignoring the hateful tweetstorms, the adultery and sexual abuse, the careless throwing around of nuclear threats, the dismantling of government programs that care for children and the elderly, that sum up the platforms and identities of these monsters. All that matters is that they will enact the reactionary throwback agenda of America's theocrats. It's leading some in the evangelical community to walk back from the word "evangelical." Believing, as the Bible teaches them, that they are called to open-hearted love, rather than bigoted rejection of the other, they are opting to call themselves simply "Christian"--and not in the way Jack Phillips uses the word. They are also coming to find the Republican party, once the champion of evangelicalism, to be an uncomfortable place to faithful persons with integrity. The Christians I admire have big hearts and open minds. They know that the morality of another person is a matter best left to that person and to God. The humble ones even acknowledge, with fear and trembling, that they could turn out to be wrong about homosexuality, just as their Southern ancestors were wrong about slavery. And when someone whose sexual orientation is different from their own walks into their place of business and puts some money on the counter, they provide them with the same quality of service they give to anyone. 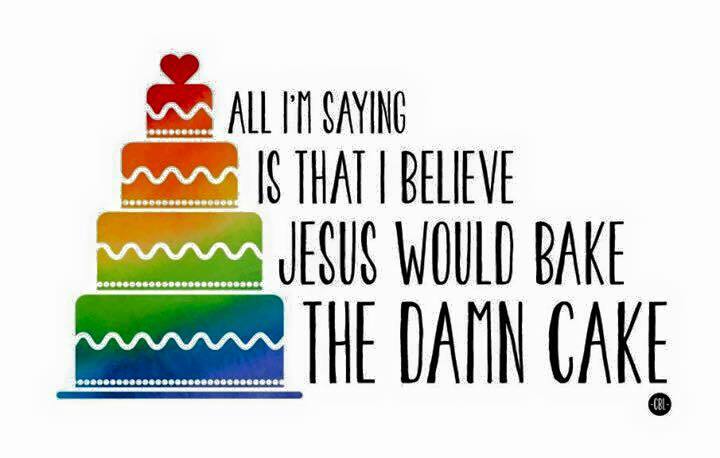 It's not just that Jesus would bake the damn cake. It's that anyone who claims to be a Christian, and operates a cake shop, would bake the damn cake. Here's hoping the Supreme Court agrees.